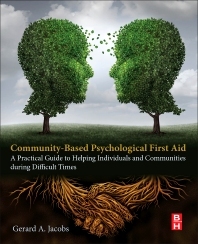 1: What is community-based psychological first aid? What Makes One Disaster More Stressful Than Another? Gerard A. (Jerry) Jacobs, Ph.D., is the Director of the Disaster Mental Health Institute (DMHI) and a Professor in the doctoral Clinical Psychology Training Program at The University of South Dakota. He has worked with organizations nationally (e.g., American Red Cross, American Psychological Association [APA], U.S. Centers for Disease Control, U.S. Department of Defense) and internationally (e.g., World Health Organization, International Federation of Red Cross and Red Crescent Organizations, Asian Disaster Preparedness Center, International Union for Psychological Science, Japan Red Cross Society). His disaster responses have ranged from minor events to the massive loss of life and chaos of the September 11, 2001 attack on the World Trade Center, the 2001 Gujarat, India, earthquake, and the 2004 Indian Ocean tsunami. He was asked to return from working on the tsunami response in Sri Lanka to set up the American Red Cross disaster mental health program for New Orleans after Hurricane Katrina. Dr. Jacobs was an “invited expert” on the National Biodefense Science Board’s (now the National Preparedness and Response Science Board) Subcommittee on Disaster Mental Health and served as a member of the National Academies of Science Institute of Medicine Committee on Preparing for the Psychological Consequences of Terrorism (Institute of Medicine, 2003). He has been working on the implementation of community-based psychological support since 1996 and has worked in more than 30 countries in developing psychological support programs.